He was the magician and exorcist with an understanding heart: he built a temple and rent a country in two. Solomon.Can enough ever be written about this compelling man who chose wisdom above all else when asked to choose his hearts desire? The tales of him are 3000 years old yet they are page turners to this day: not just the stuff they put in the books of Kings and Chronicles in the bible, but those shady rumours. The Greeks, sometime after Alexander the Great’s death, would carry little amulets with Solomon’s identity stamped on them: numerous tokens have been found from Hellenistic times and it is thought he had an apocryphal reputation for casting out demons and commanding the forces of magic in his interests. We are here today to look at Solomon’s stables and, in particular, a clerical error. They talk of the might of Solomon. Wealth and spectacle were his bag. The king made silver as common in Jerusalem as stones, write the old scribes,and cedar as plentiful as sycamore-fig trees in the foothills. And horses? You’ve never seen such horses, all imported from Egypt and other exotic destinations. But there’s a factual glitch sitting within the pages of the bible. For Chronicles insists he had 4,000 horses; while Kings says 40,000. This has sent bible geeks wild with speculation. They have pottered off to look at probabilities and chariot numbers and the size of Solomon’s chariot cities (yes, he had chariot cities). They have all come to the same conclusion: one day, some dozy scribe copied a wrong zero into the text and immortalised the concept of Solomon and his insane number of horses for eternity. Because whatever way you look at it, 40,000 horses is a lot: perhaps rather too much. I use Thomas Tilling as a way of determining scale here. Thomas Tilling: you know, the omnibus man. Born on a farm in Gloucestershire in 1825, Thomas moved to London and in 1846 bought his first horse and carriage for a princely £30. And so it began. Thomas was good at his job and had an entrepreneurial bent. 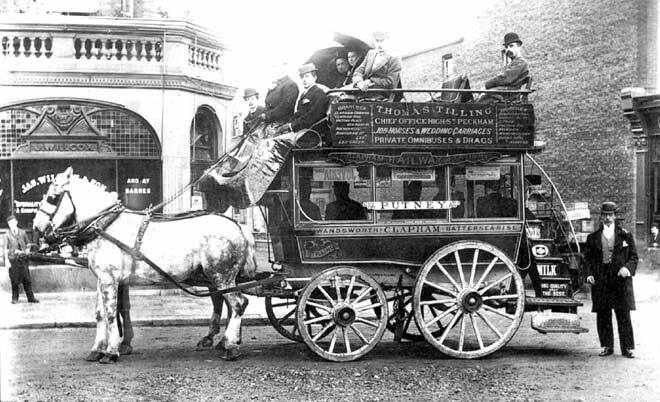 January 1850 saw him purchase his first horse bus – a bus drawn by horses – and not only that, he bought himself a route. Thomas Tilling ran his first bus four times a day between Peckham and Oxford Street. Buses in London in the Victorian and Edwardian era were a gold mine. Thomas found himself in the right place at the right time. By 1856 he owned 70 horses, he even supplied horses to London Fire Brigade; and by the time of his death in 1893, he owned 4,000 horses for omnibuses alone, let alone the ones which were rented out for private hire. Tilling was a major supplier of transport for London in the third quarter of the 19th century. It’s all about scale. He supplied around 4,000 horses; the same number it took to support the Kingdom of Solomon 3,000 years ago. Though we must put Tilling in context: and bear in mind that 3,000 year old clerical error. For 50,000 horses were required to keep Victorian London’s public transport running. It is said these horses ate their way through a quarter of a million acres of foodstuff per year, and deposited 1000 tonnes of dung on the roads every day. Tilling’s death was not the end. He achieved immortality in a number of ways: his company went on to motor buses, expanded into the provinces and became a national institution. And – far more importantly – his name entered Cockney Rhyming Slang. Thomas Tilling. Shilling. Get it? Posted in Quirks of HistoryTagged cockney rhyming slang, history, London, omnibus, Thomas TillingBookmark the permalink. So which was right? Four or forty? Either way, the manure would give fertilizer for a lot of tilling! Who knows who was right, Col….. but London in the 19th century is a good way of deciding on what scale would have been right for Solomon. Since Victorian London boasted 50,000 horses I’d say 40,000 would have been closer to the mark, but that’s just me…. I am inclined to agree – given, of course, that Solomon actually existed or is part of mythology, which remains a hot topic. On my footballing travels I discovered that Aberdeen’s ground Pittodrie is Pictish for “Dung Heap” the name is a Victorian joke as the area was where Police Horse manure was dumped. If nothing else, the pitch must grow well!!! I imagine it is a lush green, Laurence 😀 I must have a look at that. The things you find out about football pitches.